Most sinking lines are weight forward. Shooting heads can also be either floating or sinking. The primary difference between the weight forward and the shooting heads is that the shooting head has a separate running line behind it that tends to be a smaller diameter than most weight forward running line components. Thus, a shooting head will usually go to deeper depths than a similar sinking line due to less line resistance. There tends to be about six sink rate categories for sinking lines. Not all of them are equal between the manufacturers. The Uniform Sinking lines will sink as a straight line between the fly and the rod. This is mostly a stillwater-type of line. The Shooting heads can be used in either stillwaters or large streams. They were developed primarily for salmon and steelhead streams. The Sink Rate is based upon a stillwater situation. Therefore, any current within the streams or the speed of trolling in a float tube will affect the effective depth of the line. Theoretically, all of the lines will reach the same effective depth if left at a dead drift. The sinking rate differences will only reflect the speed at which the line sinks. Some guides prefer to use slower sinking lines such as Type I or II in stillwater depths up to 20'. They will countdown the time for the fly to reach a certain depth based upon the line rating before using a kick troll or a line retreive. The advantage of the slower sinking lines is that they remain within the fish zone for a longer period of time. The Sonar Sink 25 is designed with a short 25′ fast-sinking head, the Sink 25 sinking fly line gets flies deep extremely quickly and is paired with a large diameter handling section for excellent line control. It replaced the Mastery Wet Tip Express.The SONAR Stillwater Seamless Density lines are a unique departure from the traditional graduated density lines of years past. With a variety of double-density sinking rates and a smooth, seamless transition between each, the SONAR Stillwater Seamless Density lines provide straightline connections to subsurface flies, meaning you’re in control of the fly every second it’s in the water. SONAR Stillwater Hover sinking fly line is built with an extra-slow sink rate, the Hover is downright nasty when it comes to fishing streamers with a slow retrieve. WetCel Sinking is a simple, no-frills, weight-forward sinking fly line perfect for throwing nymphs and streamers to trout, bass, or panfish in streams, rivers, or lakes. 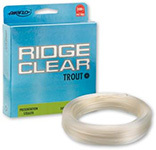 The Ridge Clear is an intermediate sinking line is designed to fish just below the surface to avoid any waking effects from the line upon the water surface. It has the slowest sink rate of any line at 0.5" per sec. What is a Forty Plus fly line? Airflo's groundbreaking line introduced the first ever blend of shooting head with traditional fly line. A short heavy head of 35 foot allows easy loading, with a thin seamlessly blended running line. For experienced fly anglers who want to cast further, with ultra fast tip action rods, who have the casting ability to maintain a stable loop, Airflo created the Forty Plus Expert so these guys can cast even greater distances. The head was increased by 10 foot, to 45 foot whilst the head weight itself remains the same as the standard. The Airflo power core smooths out any line wobble and the ridged running line reduces tangling and aids shooting. These factors combine to allow a pro caster to make smooth, powerful distance casting a dream - 40 yards is the norm not the exception with this range of fly lines. RIO’s ultra-low stretch ConnectCore results in fantastic sensitivity for detecting the softest take, and for lightning-fast hook sets. A unique “hang marker” 13 feet from the front end shows anglers when to stop stripping and to fish the “hang”, and when to recast. The line is designed with a short, easy-casting head that loads the rod from the first cast and results in long distance with a minimum amount of false casts, and welded loops on the front end allow anglers to change rigs quickly. RIO's Deep 3 is a slow sinking line developed for the lake angler and packed with the very finest benefits to help anglers catch more fish. . This line sinks about 3-4 inches per second, which is ideal for fishing between 3ft and 7ft in stillwaters, and has a blue hang marker. RIO's Deep 5 is a medium speed sinking line developed for the lake angler and packed with the very finest benefits to help anglers catch more fish. This line sinks about 5-6 inches per second, which is ideal for fishing between 5ft and 10ft in stillwaters, and has a red hang marker. RIO's Deep 7 is an extra-fast sinking line developed for the lake angler and packed with the very finest benefits to help anglers catch more fish. This line sinks about 7-8 inches per second, which is ideal for fishing between 15ft and 30ft in stillwaters, and has a white hang marker. The 444 Clear Camo Intermediate is made with a supple, crystal-clear intermediate coating over a mottled monofilament core. Slow sinking and virtually invisible to fish, it’s ideal for still or moving water.The 444 Classic Full Sinking fly line is a premium-performance, slick-shooting, durable line. Equipped with a welded front loop for extra convenience when changing leaders.Our new FO-Tech sinking line puts your flies deeper in the water column when fish are down. The density compensated sinking material gives you a perfect presentation in the water column. An ideal color change at the head and running line ensures line control and promotes better shoot ability.The 333 Classic Full Sinking line is a Type 3 sinking fly line for fishing in deep lakes and faster rivers. It’s ideal for fishing at moderate depths, while also serving as a great trolling line with a steady drop for perfect presentations to suspended fish. XS-Plus Countdown 2 in olive green with a sky-blue running line to help avoid spooking fish but visible to see for fishing depth and control of retrieve. Sink rate is 2ips (inches per second), perfect for fishing nymphs or lures beneath the surface on rivers or stillwater, close in or at long range. XS-Plus Countdown 3, with a sink rate of 3ins/sec this line has been designed for fishing nymphs or lures in more moderate depths, especially when the wind is up or with a booby on the point to provide a washing line style of fishing. Ideal when the fish are at a depth of 2-3ft and you can get there easily within a few seconds. Twin color, chestnut brown head with light tan running line. XS-Plus Countdown 5 is a great casting line with dark brown head providing a sink rate of 5ins/sec and a distinctive, silky smooth blood red running line. Really versatile for a team of sunk lures fished deep and slow, or ripped through the upper surfaces on a windy day. A great mid-water booby line too and phenomenal casting ability with the long head and no memory. Also suitable as a predator line in upper sizes, which will turnover easily and provide extreme casting ability. XS-Plus Countdown 7, the fastest sinking Snowbee line yet. The density of the charcoal grey head provides a sink rate of 7ins/sec, ideal for deep sinking lures, nymphs, and boobies off the boat or really quick sinking for boobies and exploring the depths from the bank. The deep blue running line aids angler visibility without spooking the fish. The profile and density provide an excellent distance casting line, capable of quickly reaching the bottom in over 20ft of water. This line will sink about as far as you can cast with a memory free profile that aids casting on the roughest of days.